Eating outside during the warm spring and summer is something many of us look forward to. 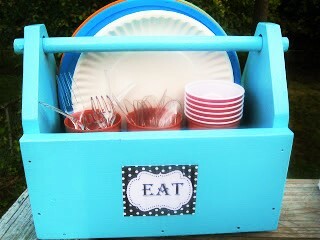 By repurposing an old basket, you can make a cute picnic caddy so you can just grab it when dinner's coming off the grill and get to eatin'! 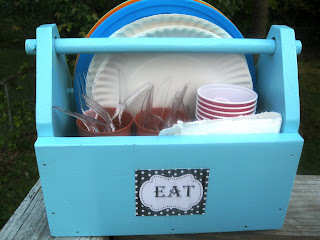 I first saw this idea over at madiganmade.com last summer. I saved the idea and was on the hunt for a basket as cute as hers. I swear you know you've seen them everywhere UNTIL you go looking on purpose for them! I looked for almost a year at yard sales and thrift stores with no luck. I did find the little wooden basket I did use, for a dollar. It sure needed some love let me tell you! But, I think it turned out pretty cute. 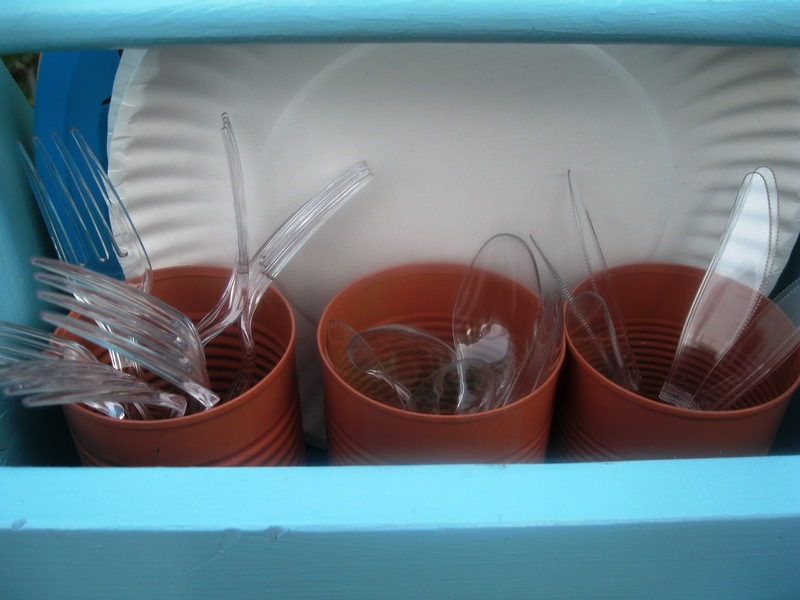 1) Find your basket: The key to choosing a basket is to make sure it is large enough to fit your plates (paper or reusable plastic) and that the handle runs the long way down the basket not across the short sides like most do. 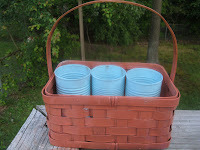 Here is another basket I had on hand that shows the kind of basket to look for. 2) Collect some cans from recycling: I used 3 steel cans that had greenbeans or corn in them. Just wash them out and remove the label. 3) Grab your spray paint and embelishments. I used two colors of Krylon spray paint. 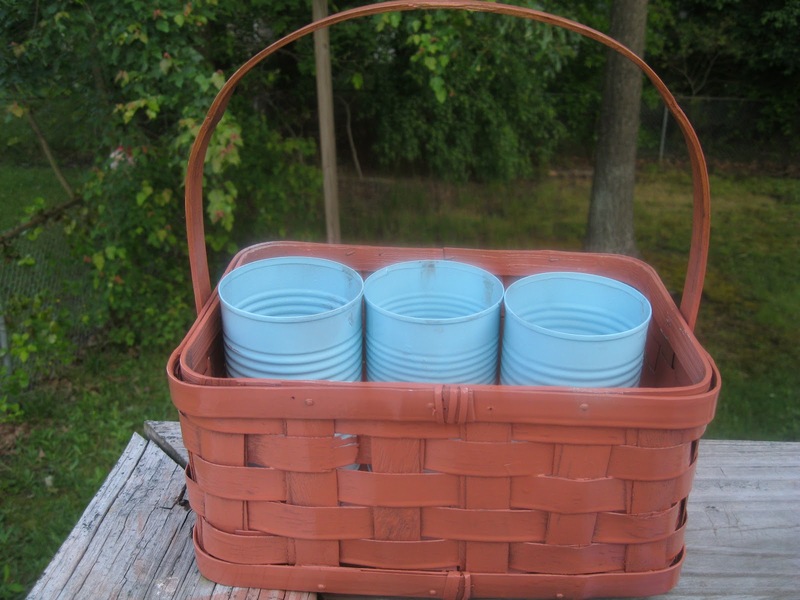 Ocean Breeze Blue for the basket and Tuscan Sunset (which looks just like terra cotta!) for the silverware holders. Spray paint your basket and your cans. I chose to embelish mine with a little clipart from the computer, but you can use scrapbooking stickers, paint, stencils,etc to decorate it up anyway you like! (I think modge podging a red/white gingham table cloth on the front with little ant stickers marching across it with the word PICNIC would be adorable! 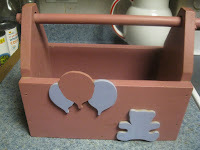 If you add anything onto the painted basket to embellish with, make sure you spray it all with a finished layer of clear sealer before you use it. 4) Glue in the silverware holders Before hot gluing your cans in the center of the basket, decide on your placment. Grab your plates and napkins you may be using and play around with it and make sure you leave enough room for your plates, etc when deciding on can placement. Also, with 3 cans there really wasn't room for cups which I really wanted, so I think I might remove one of the cans and leave that space open for cups. Although I had some small cups that fit inside one of the cans, that wouldn't work for regular reusable plastic cups. So think about what you want and when you're ready hot glue your cans in place. 5) Fill it and use it!